This product requires the base game Overlord. Slavish and loyal they'll smash, destroy, kill and steal anything for you. Your word is law. Do you want fear, respect, gold and power? Become the most powerful being in the world by any means necessary. Show the Seven Heroes, demonic Halflings, and Rabid Unicorns who's boss. © 2005 - 2007 Triumph Studios B.V. ("Triumph"). All rights reserved. "Codemasters"® is a registered trademark owned by The Codemasters Software Company Limited (“Codemasters”). The Codemasters logo is a trade mark of Codemasters. 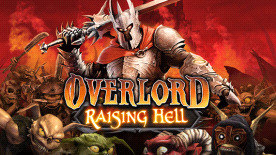 "Overlord"™ is a trademark of Triumph. All other copyrights or trademarks are the property of their respective owners and are being used under license. Developed by Triumph and published by Codemasters. Unauthorised copying, adaptation, rental, lending, re-sale, arcade use, charging for use, broadcast, cable transmission, public performance, distribution or extraction of this product or any trademark or copyright work that forms part of this product is prohibited.